So…… we have one BIG question …. do you own a houdini??!! This winter we are throwing down the gauntlet and challenging the worst houdini’s of all shapes and sizes – we will be running multiple competitions where you can WIN one of our rugs if we think your houdini sounds like the ultimate challenger…. were looking for the best challengers to show just how very very effective our rugs are – so the bigger the challenge the better! The winners will feature on a special Guardian vs page on our website and we will follow up with your houdini after they have used their electric fence rug for a few weeks and tell your stories across our various social media platforms and magazines. Keep and eye out for the comps in the equestrian magazines and online over the winter months for more news, or email us at sales@guardianequestrian.com for more information. Can you layer up rugs underneath Guardian rugs? My horse goes through electric fencing when not wearing a rug – will your rug work? How well does the rug transmit the pulse from my electric fence? 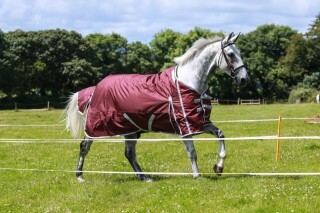 Do our rugs increase risks to your horse in storms/lightening?